Much as I’m enjoying my family history research, I’m struggling to organise my discoveries into a format that will make them accessible and interesting to others. Or even useful to my future self. My memory is nowhere near as good as it once was and I need to find a better way of documenting my material than bookmarking links and scribbling notes on random bits of paper. Suggestions welcome! It’s a long time since I did any kind of formal study and I wasn’t very disciplined then either. In theory I’m currently focusing on my Great Grandmother Elizabeth Ann Curtis (née Bridle), but where do I draw the lines around my researches? I want to create a picture of her life and the wider world in which she lived beyond the bare facts available on Ancestry. To fill in the background and try to understand, just a little, what it might have been like to live her life. I’m sure young Elizabeth Ann was known in her family by a diminutive, but which one? There are plenty of options, but she named one of her own daughters Bessie so I’m going to assume that was her family nickname and refer to her as Great Granny (GG) Bessie. In later life Dad and his sisters called her Granny Curtis. My first sighting of GG Bessie on Ancestry.co.uk is the record of her baptism on 6 October 1867 at the parish church in Charminster, Dorset. She was baptised on the same day as her younger brother John, though she was born in 1864. I have the date of her birth as 22 May 1864, which would have been her parents’ second wedding anniversary. Lizzie and John’s older brother George was born in 1863. I’m unsure about the veracity of the date 22 May, so maybe I’ll fork out for a copy of her birth and marriage certificates some time. For the present I’m trying to focus on building up a picture of what young Bessie’s life might have been like at Forston Farm in the early 1870s. The farm is located in the Cerne Valley midway between Cerne Abbas and Dorchester within what is now the Dorset Area of Outstanding Natural Beauty. The beauty being only partly natural and also owing a great deal to the activities of the human occupants. I imagine that the landscape was lush and gorgeous during the summer months in the 1870s, but much less appealing and very hard to live in during cold, wet weather. More anon, for now here is a bad picture of a map I culled from the maps section of the Family Search website showing England & Wales Jurisdictions in 1851 overlaying an Ordnance Survey map (date unknown). 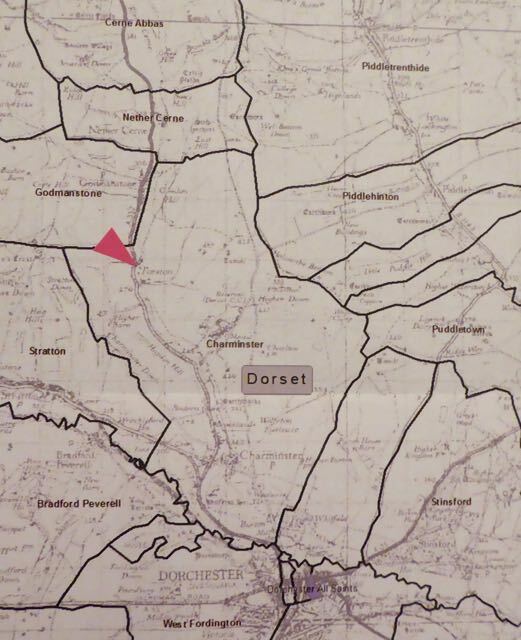 This, old-maps.co.uk and Google Maps have been very useful to me in building up a mental picture of the area where Bessie began her life. I’d love to visit for myself and walk the lanes that my ancestors walked, but it would probably be hard to imagine young Bessie’s daily journeys to and from school with a constant stream of fast-moving traffic rushing past me. This entry was posted in family history and tagged family history, maps. Bookmark the permalink.